Minimum order with your imprint, 12. Quantity variation +/- 5% is possible & billable. Setup $55 Exact re-order within last 24 mos. Setup $27.50 No imprint. No Setup Charge. This portable and powerful Bluetooth® speaker makes a fashion statement, also. 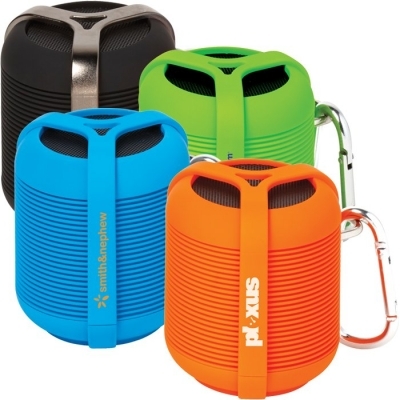 It has a remarkable sound quality, and can be used outdoors or indoors. It has the IPX5 water resistant rating. It uses the new V2.1 EDR Bluetooth® technology. Its range is 33 feet, with 5 hours of listening power in its battery. The time to recharge is only 3 hours. A USB cable, auxiliary cable and a written manual are included. The controls include a volume control, power indicator and button, and a built-in mic with a button for hands-free calling. This is a nice business gift, and available in a small quantity. Price includes 1 standard color imprint in one location.